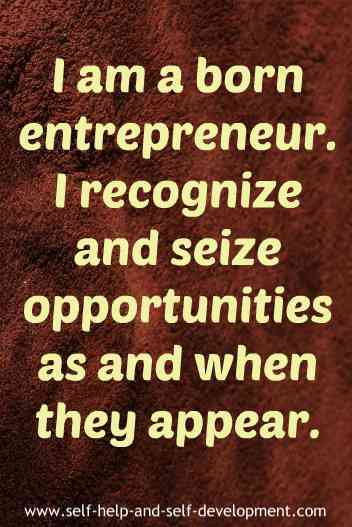 21 Career Affirmations To Help You Build A Successful Career. Career Affirmations will help you have a clear vision of your career, your goals, your attitude, your relations with your colleagues, bosses and juniors and a host of other things. Career is defined as ‘a chosen pursuit, a profession or occupation; the general course or progression of one's working life or one's professional achievements’. It is but natural to aspire to a successful career of your choosing. Job satisfaction and a good monetary compensation is what one desires. A career can be in a job, a profession or even a business. Satisfaction in a job well done and an attractive financial reward is possible in all the three mentioned above, if some essential steps are taken. Knowledge, hard work, planning, vision etc. are important. But what is more important is the right mental attitude. As Thomas Jefferson put it: Nothing can stop the man with right mental attitude from achieving his goal; nothing on earth can help the man with the wrong mental attitude. There are times when we need a mental boost in our work. Our own pep talk! This is what career affirmations can do for us. 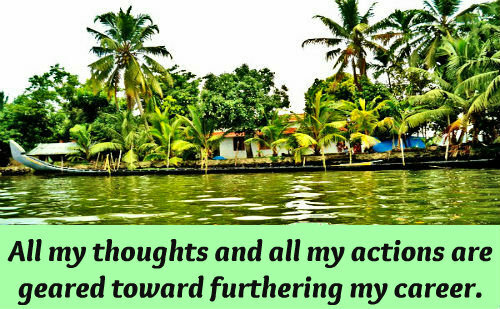 The affirmations given below will help you to tune up with your work, your colleagues, your bosses and your juniors. They will help you focus on your career and remind you from time to time about your priorities in life. Pick up any one or more career affirmations from below. Use them separately or combine them. Repeat the affirmations at least a hundred times daily, preferably in front of a mirror. Slowly and surely, you will develop a mindset conducive to success in your chosen career. All my thoughts and all my actions are geared toward furthering my career. I love my career as it gives me complete job satisfaction. Right now, I am working at my dream job. 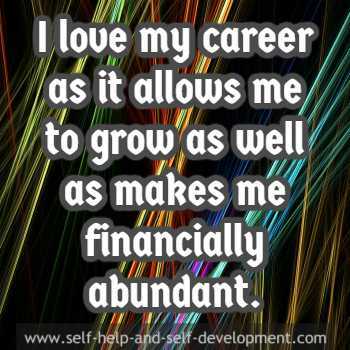 I love my career as it allows me to grow as well as makes me financially abundant. 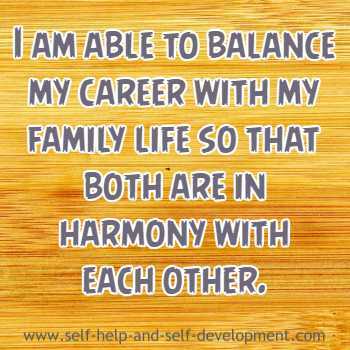 I am able to balance my career with my family life so that both are in harmony with each other. My job offers me great career prospects, promotional opportunities and monetary compensation. 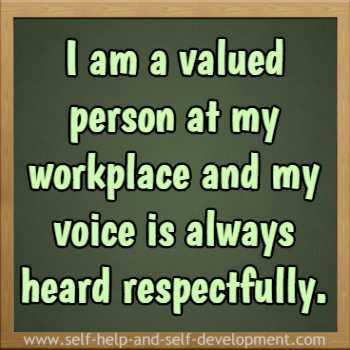 workplace and my voice is always heard respectfully. I have a great relationship with my colleagues as well as my boss. 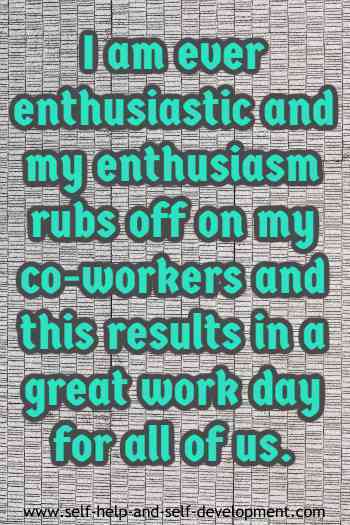 co-workers and this results in a great work day for all of us. I am a master salesman. 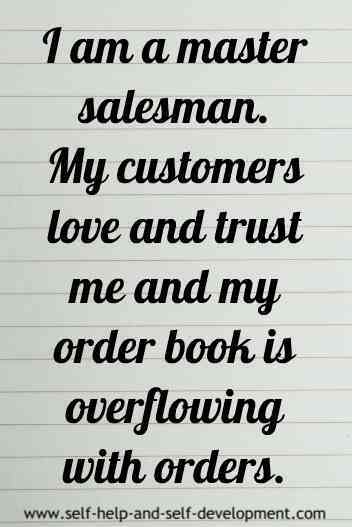 My customers love and trust me and my order book is overflowing with orders. My work ethic ensures that I get regular promotions and monetary incentives. Self discipline is my forte. At the workplace, work is my priority and at home, family is my priority. I take full responsibility for my work. ‘The buck stops here’ is my motto. I follow the rule ‘Work is Worship’. Diligence in work, honesty in attitude and a positive frame of mind open up new horizons for me. I take good care of my juniors and guide them appropriately. I am friendly with my colleagues and respectful to my seniors. Career to me is a means to an end. That end is happiness and fulfillment of potential and my career is providing it to me in abundance. I am doing my best in my career and giving my everything without reservation. The fruits of my labour are always so sweet. My main aim is satisfaction of my customers and I strive my best to achieve that aim. 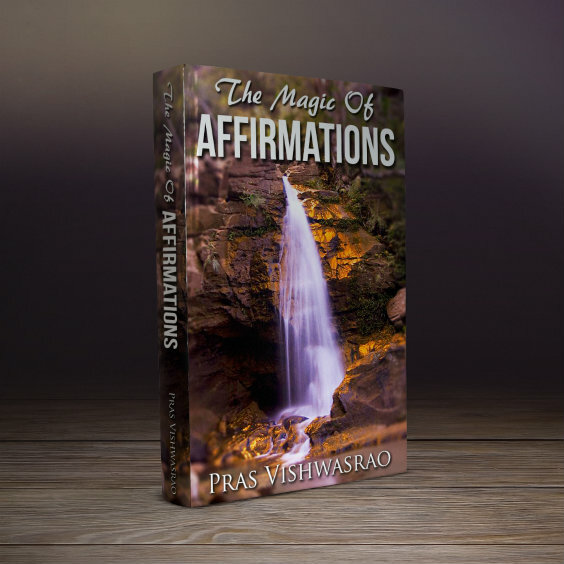 Another way of using career affirmations is through hypnosis CDs or MP3 downloads. As you are aware, hypnosis is a powerful way of influencing the subconscious. If, in addition to affirmations, you also listen to hypnosis CDs or MP3, once in the morning and once at night before sleeping, it will do wonders to your progress.